The Best Organizer to Keep Everything You Need Within Easy Reach When Pushing Your Baby's Stroller. There are lots of great improvements and features to make your daily life so easy! This organizer is universal fit for most strollers. Easily collapsible as your stroller folds. * Perfectly designed to fit most makes and models of strollers. * Super-durable Strong stitching with the best high-quality fabrics. * Easy to clean and wipe off, remains stylish for the long term. * 3 outside pockets for keys, mobile phones, ear phones etc. 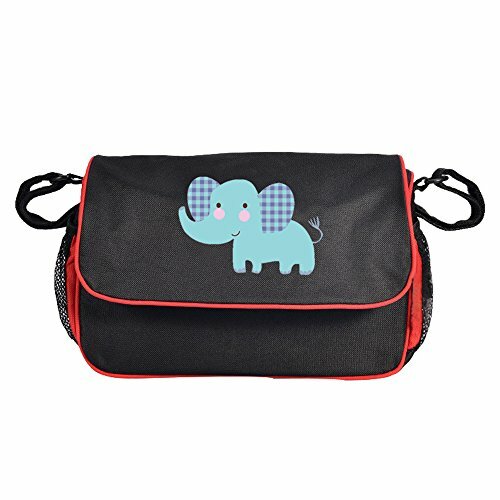 * Large middle compartment fits for diapers, wipes, or toys. * Very easy to keep clean, simple and easy to install. * Straps fasten securely to handles and adjust for angle and width. Multifunction Convenient Stroller Organizer meet all your requirements with 1 big storage area, 2 hidden separate layer bag, 2 water cup bottle holder and 2 outer pockets design. Outstanding Fashion Smart Universal design baby stroller organizer/bag suitable for all baby stroller on the market. If you have any questions about this product by Babyhood, contact us by completing and submitting the form below. If you are looking for a specif part number, please include it with your message.